Modern Pest Services was established in 1945 as a family-owned and operated pest control company. In 2017, Modern Pest Services partnered with Anticimex, a global preventive Pest Control company. Modern"s headquarters are located in Brunswick, Maine. There are service centers in Bangor, Augusta, and Westbrook, ME; Manchester, NH; Boston, MA; and New Haven, CT. Modern employs over 200 talented service, sales, technical, administrative and management professionals. We live and work in the neighborhoods we service and proudly serve over 30,000 residential, commercial, and wildlife clients in Maine, New Hampshire, Massachusetts, and Connecticut. Great timely service. Very courteous technicians. Hi Michael! We're glad you had a good experience with Modern. Thanks for the 5-star review, and have a great weekend! Kyle and Zach were very helpful coordinating with my winter caretaker to get in the house. The extra effort was most appreciated. Hi Laurel! We're glad to hear Kyle and Zach did a good job and were able to complete the service. We've passed your great review along to their managers. Thanks so much! Travis did a great job; thank you! Hi Dennis! Thanks for the awesome review! We've passed it along to Travis and his managers. Have a great week! So far so good. Company very flexible with helping us address seasonal issues and they always come when they say that they will, very little that we need to do. HI Eileen! Thanks for the great review. We're here if you need us! Great customer service and attention to detail. We have had their service for over 10 years. Hello Joan and Norman! We're so happy you've been pest-free. Thanks for the great review, and enjoy this snowy first day of Spring! Greg did a great job at our house yesterday. He has been here before and we are always pleased with his service. He found and checked all of our 18 baits. We were happy to hear that we'd had little activity in them since his last visit. This is probably due to the weather, but Greg had also closed up a hole underneath our deck on his last visit, so I'm sure that would have helped as well. All of your service people are knowledgable and take their time whenever they come to our home, and we appreciate all that they do. Thank you again! Hi Steve! Thank you letting us know that Greg is doing such a great job and that you've been pleased with Modern. We appreciate the great review! Enjoy your weekend! Great company to work with, very fast and efficient. Seth was extremely helpful and informative. Will definitely use them again, if needed. Hi Ralph! We're happy to hear you've had a good experience with Modern. We've passed your review along to Seth and his managers. Thanks for the great review! MP has been so great to work with. Always very professional, prompt and courteous. We have definitely noticed a decrease in insects in our home since starting with them and we love the frequent checks of our home for peace of mind on other critters! I would definitely recommend their services. Hi Kailee! Thanks so much for taking the time to write such a great review. We appreciate it! Have a great weekend! Matthew was very professional and knowledgeable. He did a comprehensive home evaluation, and clearly explained his recommended treatment. He answered all my questions respectfully and made me feel that I was a valued customer. I feel confident that our situation will be resolved satisfactorily. Hi Joe! We're happy to hear you had such a good experience with Matthew. We will pass this along to him and his managers. Thanks for the great review! Very happy with service & technician that services us. Hi David! Thanks for the 5-star review! I've passed it along your Service Pro Irving Jones and his managers. Have a nice weekend! The technicians were right on time, friendly, knowledgeable and efficient. 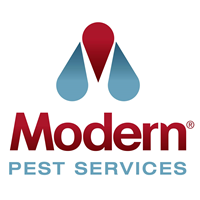 I look forward to working with Modern Pest as they help remediate my pest problem. Hi Wealthy! We're so glad to hear you've had a good experience with Modern. We look forward to keeping pests away from your home for years to come! Hi James! Thanks for the feedback. We appreciate you taking the time to let us know you've been happy with your service. Have a great weekend! Scott does a good job. I liked the 4 times a year program better. Thanks for the great review, Raymond! We have passed it along to Scott and his managers. If you have any questions about the tri-annual service, you can contact us at 1-800-323-7378. Have a great week! Anthony was very professional and answered all of my questions. Would recommend you to others who are in need of your services. Hi Barbara! We're pleased to hear that you had a good experience with our Wildlife Division and that Anthony did a great job. We've passed the review along to him. Thank you for the great feedback! I hired them in 9/18 for mice and cancelled by 1/19. When I signed up I found out later they over sold what they actually do, they do not help prevent any issues and get down to the cause, they strictly just set bait and nothing else. You sign a contract that if you cancel within 1 year you pay $200 you also pay sign up for a little shy of $200 then you pay $40 monthly. I did not decide to write this review until I felt borderline harassed by a company that all I wanted was to simply cancel due to what I said at the beginning of this, I called them 1/10/19 to cancel but a service manager was unavailable so they said they would have to call me back, I did not hear anything and by 1/11 I called again and still the same response but received attitude from the receptionist that I was speaking with. I finally received a call back by 1/14 I could barely get a word in the service manager was just constantly pitching sales pitches one after another. But I cancelled the service, then Today 1/17 someone from modern pest shows up at my house un-announced, I told him I cancelled this service 4 days ago and he did leave, but I never even scheduled a service for today in the past, so they either did it to me to try and stay or they schedule one and don"t tell you about it, I never got a phone call or anything about someone coming to my house. So I would not recommend going with this company unless you never have to deal with cancelling with them or your unable to set a mouse trap because that is all they do with mice. Matt Grenier was very helpful, honest and professional. He arrived within the allotted time frame given, even in a snow storm, and he listened to my concerns regarding flying squirrels and then completed a thorough interior inspection in my attic. I am very pleased with his work, thank you again Matt. Hi Breanne! We're happy to hear that Matt did a great job. We have passed the review along to him and his General Manager. Thanks for the great review as well! Happy New year! The two guys you sent were very thorough, helpful and friendly. Thanks. Hi James! We're happy you had a good experience with your Service Professionals. Thanks for the great review, and happy new year! pleased with their prompt service. Hi Ruth! We're glad that we could provide service quickly. Thanks for the great review, and Happy New Year! Hi Lynn! It's so great to hear that you've been happy with Modern. We appreciate the feedback, and the great review. Happy New Year! $2000 over the last couple years and we still have mice. Hi John. I'm sorry to hear you're still having issues with mice. Could you please email me your service address and phone number? My name is Jen Harmon and I'm in the Marketing Specialist. My email is jen.harmon@modernpest.com. Thanks! I think your service is valuable. Thanks for the feedback and the great review! Enjoy your week! Thank you for giving me the opportunity to comment on your service. I found the service you rendered very helpful and service oriented. The people who came to my location were very professional as well as being friendly. Thank you for your service and it seems to have done the job. I've had none of my tenants saying that they have seen or heard any rodents since you were there. Hopefully we won't be seeing any more. Don Hutchings / Meloons Inc, Portland, Maine. Hi Don! We're happy to hear you haven't had rodent activity since your service. We'll come back any time if you have any issues. Thanks for the great review of your Service Professional Matt Langlais and of Modern in general. Have a great week! Matt Grenier was very knowledgeable and professional. Outstanding service! Hi Kate! Thanks for the great review! We'll let Matt know that you've been happy with his service. Happy Thanksgiving! I can always count on Modern Pest to come out whenever I call with a problem between regular service calls. The technicians are always helpful and knowledgeable. Hi Nancy! We're so glad to hear that your pest issues have been taken care of thoroughly and efficiently! Thanks for the great review. Enjoy your week! Have used Modern for 20 years at our residence and business. Very satisfied. Rat, mouse, cluster flies, wasps, and carpenter ants have all been situations they have responded quickly to and resolved. Hi Brad! Thanks for the amazing review! 20 years is a long time, and we appreciate the ability to service both your home and business. Thanks again! Associate was prompt, knowledgeable and professional.just waiting now to see results. Hi Steven! Thanks for letting us know you had a good experience with your Service Professional. Please let us know if you have any questions about your results. Thanks for the great review! The technician that came to our house was so professional and went above and beyond expectations. We are so happy with the service he provided. Hi Stephanie! We're so pleased to hear that you had a good experience with your Service Professional. Thanks for the great review! Hi Allen! We're happy to hear you had a good experience with Modern. Thanks for the great review! Once I called to terminate our rat issue, I never saw modern or the rats again! They came early did there work and got the job done. Hi Matt! Thanks for the great review! We're glad you haven't seen any rats, but we'll be sure to be there if you need us! Found 2 dead mice afterwards. That means it's working! Thanks for the great review, Alice! Hello! Thanks for the 5-star review! Have a great weekend! excellent customer service, was very happy she was able to get someone there within 48 hours and problem seems to be going away. Hi Cindy! That's great that your pest problem seems to be fixed. We're here if you need us! Thanks for the great review, and enjoy your weekend! We like this monthly service and respectful staff even though it hasn't been effective enough to eliminate cockroaches from our business building. Hello! Thanks for the great review! If you're still having cockroach issues, please feel free to call us at 1-800-323-7378 and we can come back out. Have a great weekend! Al arrived early and gave great information about the upcoming fall and winter months. Enjoyed speaking with him. Performed the outside service very well. Hi Dawna! We're happy to hear you had a good experience with Al. We've passed your great review along to Al and his manager. Have a great weekend! Mr. Cyr, the initial contact did a great job of detailing the process and communicating to get the project going. Hi Leslie! It's great to hear that you had a good experience with Eric Cyr. We've passed along the review to him. Thanks, and have a great weekend! Great service, prompt and knowledgable techs. Hi Cassandra! We're happy to hear you've had a good experience with Modern and our Service Professionals. Thanks for the great review, and have a nice weekend! I had to call to set up a new location for service a couple of weeks back. Eric was super helpful and actually was able to do the initial inspection the very next day. This was extremely helpful and out employees at that location were very thankful for it as well. Hi! Thanks for the great review. We're happy to hear that Eric could get out there so quickly. We will be sure to let him know you were pleased with the service. Thanks again! Excellent service and knowledgeable people in the office and out at the job site taking care of business. Hi Brian! Thanks for the great review! Happy to hear you've been pleased with Modern's services. Have a great weekend! For the first time I decided to have modern pest spray for mosquitos, ticks, etc. The lresults were fantastic and I plan to use them again next year. The company has been very flexible in scheduling and very professional in all my interactions with their employees. Hi Peter! We're so happy to hear you've had a good experience with our Vector service and our Service Professionals. Please let us know if there's anything else we can do. Thanks! Finally a reliable company! Was able to get an appt ASAP to take care of my bee problem and Matt the exterminator was awesome. Though I hope not to have future pest problems, I do look forward to booking them again if I ever do. Hi Stacy! Thanks for 5-Star review! We're glad that Matt took care of your bee problem quickly. We're always here if you need us. Have a great Labor Day weekend!